The Canterbury Basin lies to the east of the alpine area of the South Island and continues up to 150 km offshore to water depths of up to 1,500 m. Overall, the basin covers some 48,000 km2 with a maximum thickness of over 5 km of sediment and average of 3 km. This would suggest that there is a potential for some 3 x 108 m3 oil equivalent to be found in the basin based on world average figures. Fig. 6.5. 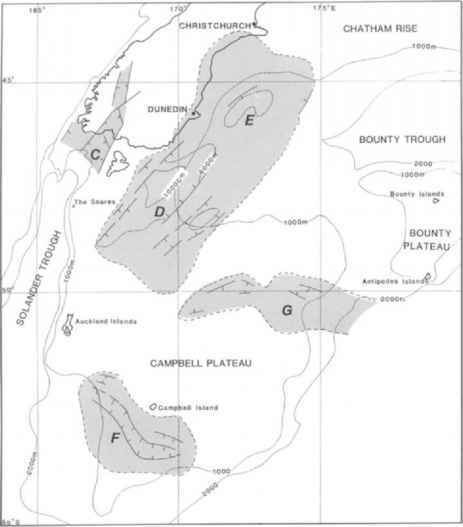 Map of the Campbell Plateau showing the major sedimentary basins and their gross structuring. Basin identification is given in Fig. 6.1.
showed that the potential reservoirs had been flushed with fresh water but two of the offshore wells did have good condensate and gas shows present. Galleon-1 proved sub-commercial reserves of 4 x 108 m3 gas and 0.2 x 106 m3 of condensate. From geochemical studies of the condensate, the source of the oil appears to be terrestrial organic material suggesting that the coal measure sequence has provided the hydrocarbons. Studies also show that the Palaeocene marine shales are rich enough to be potential source rocks for hydrocarbons in the area. The potential reservoirs for the area lie in the sandstones of the Late Cretaceous coal measures and the Palaeocene to Eocene marine sandstones. The stratigraphy includes a broadly transgressive sequence of synrift and early post-rift coal measures and conglomerates followed by marine sandstones, mud-stones and finally limestones. A strong regional unconformity within the Oligocene limestone separates this lower transgressive sequence from an overlying regressive sequence of marine siltstones and sandstones that filled the western part of the basin during the Neogene orogenic uplift of the Southern Alps. Local episodes of volcanism occurred at intervals throughout the basin's history. As the lower transgressive sequence onlapped to the west, stratigraphic pinch-out structures are present in combination with the extensional faulting. This faulting is not normally observed above the Palaeocene sequence. However, reverse movement occurred on pre-existing fault zones during the beginning of the Miocene giving rise to anticlinal structures. The third kind of structures found in the basin are those associated with volcanic doming. The Great South Basin lying southeast of the South Island is the largest of New Zealand's sedimentary basins. It covers about 85,000 km2 with all but a few hundred km2 offshore (Fig. 6.5) and extends to water depths of up to 1,500 m. However, two-thirds of the basin lies in the water depths less than 1,000 m. The maximum sediment thickness is 7.5 km with an average of around 4 km. Using world average figures this would suggest that reserves of 6.5 x 108 m3 oil equivalent should be present. Commercial exploration of the basin began in the mid 1960s. The information base for the area now includes more than 50,000 km of seismic profiles and eight offshore wells. These wells have confirmed some potential for the basin, with shows of gas and condensate in two wells together with the sub-commercial test of 1.9 x 10s m3/day gas and minor amounts of condensate at Kawau-1A. Unfortunately, a large percentage of the basin is in water deeper than 500 m and ranges up to 350 km from land (Fig. 6.5). To be commercial, any field will therefore have to be in at least the giant category of reserves. The Great South Basin is a fault-controlled basin. The majority of the faulting appears to have been active up to the Palaeocene but not since. The basin floor is block faulted in a series of horst and graben structures, typical of tensional tectonics. The tensional nature of the faulting around the whole basin, the trend of the basin parallel to the eastern margin of the Campbell Plateau and its timing all suggest that the basin had its origin as the response to the crustal thinning under the plateau during the separation of the region from Antarctica. The sedimentary sequence contains over 5 km of mainly Cretaceous and Early Tertiary rocks. These consist of thick basal coal measures and fluvial deposits overlain by a Late Cretaceous to Eocene marine clastic sequence. By the Oligocene, the source of clastic material was removed from most of the basin and for most of the Late Tertiary the sequence was dominated by fine-grained calcareous deposits. During the Pleistocene, a clastic wedge of sediment was deposited over the western margin of the basin. In the wells drilled in the Great South Basin, the hydrocarbon indications have been restricted to the Cretaceous section. Geochemical analyses of the only test gas and condensate in the Kawau-1 A well indicates that these hydrocarbons have been derived from terrestrial and coaly organic matter. The rocks of the basal Cretaceous sequence contain abundant humic kerogen and some thick coals. In addition, the Late Cretaceous and Palaeocene restricted marine mudstones contain organic material which has the potential to generate oil (Anderton et al., 1982). The character of the source rocks indicates that the basin should be considered as a primary gas condensate source with some light waxy oil potential. The maturation level of the potential source has been measured in all of the wells drilled to date. It has been found that only the Cretaceous sediments have reached maturity with reflectance levels of 0.75% at the 3,600-4,200 m level. Extrapolation of the maturation level into the thickest parts of the basin, however, shows that some of the Lower Palaeocene sediments will have reached maturity. With the assumption that the basin has had a similar geothermal gradient throughout its geological history (and therefore similar depths of burial have been required to reach maturity in the past), it can be shown that there has been some generation of hydrocarbons since the Palaeocene. The Late Cretaceous to Early Tertiary marginal marine sandstones are the principal reservoir targets of the Great South Basin, although the fluvial sands associated with the coal measures of the Late Cretaceous have potential. Where these have been encountered in wells, they show good reservoir porosities of 17-20% and permeabilities of between 10 and 100 millidarcies. With very little tectonic deformation in the Great South Basin, the structures with hydrocarbon potential are derived primarily from sediment drape over basement highs combined with limited faulting. The sizes of these structures are of the order of 200 km2, with up to 300 m of vertical closure. The potential for finding large quantities of reserves in the Great South Basin is still good if any one of these structures is found to produce oil. The mudstones and siltstones deposited during the marine transgression provide good reservoir seals, especially in the southern and eastern areas. However, these mudstones were only present on the western side of the basin from the Eocene, so the seal potential of this region is not good. (Anderton et al., 1982). No exploration wells have been drilled within this basin but DSDP hole 277 was drilled on its western margin. The basin has a total area of about 20,000 km2 and, like the Great South Basin, is a deep, essentially linear, normal fault-controlled depression. It had its origin during the rifting of the Campbell Plateau from Antarctica when the basement crust thinned. The basin lies in water depths of 200 m in the northeast towards Campbell Island to about 850-1,000 m at its southern edge. Upwards of 5 km of sediment is present in the large graben located on the southern side of the basin. To the north of this deep graben lies a series of subparallel horsts and grabens of lesser relief. The basin may be open to the south (i.e., has been truncated by the Antarctic/Campbell Plateau Rift) but this is unproven. The fault growth in the basin follows the same pattern as the Great South Basin. Very rapid fault movement occurred during the early stages of development of the basin which was then followed by a general downwarping during the latter part of the basin subsidence with none of the upper beds cut by the initial faulting. No direct control is available for the stratigraphy of the Campbell Basin but a sequence of Late Cretaceous and Tertiary rocks are present on the adjacent Campbell Island (Beggs, 1978; Cook 1981). 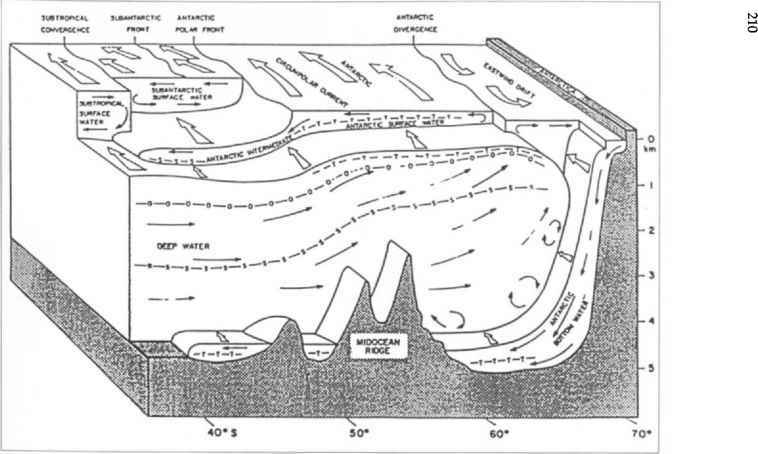 Within the basin, seismic mapping has been used to separate three main sedimentary groupings (Anderton et al., 1982). On Campbell Island, the latest Cretaceous (Maastrichtian) to Palaeocene Garden Cove Formation consists of fluvial channel/point bar deposits at the base grading up through estuarine channel and mud deposits to fully marine mudstones at the top. This transition from non-marine to marine approximates the same transition as in the Great South Basin. Within the Campbell Basin, the seismic response of the Cretaceous sequence has been interpreted as lacustrine shales which have been flanked by fluviatile, lake shore and coal swamp facies where sands and silts predominate (Anderton et al., 1982). Immediately overlying the horizon mapped as the top of the Cretaceous is the marine transgressive sequence; its seismic character indicates good sand horizons. On Campbell Island, the facies equivalent is seen in the middle estuarine channel deposits of the Garden Cove Formation. The slightly later age of the transgression on Campbell Island reflects its marginal location beyond the basin edge. Above the Palaeocene, the sequence within the basin is undoubtedly equivalent to the Tucker Cove Limestone of Campbell Island with fine-grained limestone and chert, as was also seen in cores from DSDP site 277. It is unknown if sedimentation has been continuous in the Campbell Basin throughout the Late Tertiary. There is no immediate evidence of any of the Miocene-Pleistocene volcanics of Auckland and Campbell Islands being present within the basin. Although no wells have been drilled in the basin, the parameters required for hydrocarbon accumulations can be assessed from the outcrop data on the Campbell Island and by comparison to the Great South Basin. Samples taken from Campbell Island are consistently less than the 0.5% total organic carbon which is considered the minimum necessary for a source rock (Phillips Petroleum, 1976). This is to be expected in the sedimentary environ ments represented. In the Campbell Basin itself, it is concluded that the total organic carbon content of the lacustrine and any lake-margin coal measures would be much higher than their equivalent fluvial rocks on Campbell Island. As in the Great South Basin, the Cretaceous coals probably contain a similar flora to those of the western side of New Zealand. These coals could therefore be the source of liquid hydrocarbon as well as gas. Given that the geothermal gradients have been about the same as those in the Great South Basin, we can expect maturation to have started in the Campbell Basin below 3.5 km. In fact, due to the much closer proximity of the Antarctic-Campbell Plateau rift, this assumption of the same geothermal gradient as the Great South Basin is probably on the conservative side. This could mean more of the Campbell Basin sequence would have reached maturity. Widespread clastic reservoir development probably has not occurred in the Campbell Basin. However, two zones could well act as reservoirs. The marginal beach sands of the lacustrine facies and associated channelling of any coal swamps could be one reservoir sequence while the development of transgressive beach sands overlying the lower sequences may have developed at the time of the Late Cretaceous-Palaeocene transgression. Given the quartz-rich nature of the basement rocks, the presence of well sorted quartzose sands is reasonable in the above environments. Sediment drape over the irregular basement is the major source of structures in the Campbell Basin. As these decrease rapidly up into the overlying sequence, closure associated with the marginal faults would therefore be more viable for hydrocarbon traps. Sealing for these trap types would come from the shales and chalks which predominate in the upper sequence. Location of reservoir sands would be a greater problem than sealing with fine-grained sediments. While the Campbell Basin has not yet undergone extensive exploration, it does have a thick sedimentary fill with the potential of some of it being mature for hydrocarbon generation. The similar tectonic setting and seismic reflection character of this basin to the Great South Basin allows consistent geological interpretations to be made incorporating the evidence from both Campbell Island and DSDP site 277. Until it is drilled, the hydrocarbon potential of the basin is speculative. However, the interpretations suggest that it is worth considering on strategic grounds even if it is not viable economically. On the Campbell Plateau, an elongate basin trends east-west from the continental margin in the east to the southeast corner of the Great South Basin (Fig. 6.5). This relatively small basin (40,000 km2) is not joined to the Great South Basin but has a basement ridge separating the two. Two sedimentary sub-basins, the Pukaki Basin and the Pukaki Embayment, have been recognized. Within this trend, each sub-basin has up to 3.5 km of supposed Cretaceous-Tertiary section. Campbell Basin, no seismic mapping or evaluation has been carried out on this basin to date. An overview of the seismic data suggests that, like the Campbell Basin, the Pukaki Basin originated through extensional faulting and is therefore of comparable age. The sedimentary fill is unknown but seismic reflectors similar to those in the Campbell Basin and Great South Basin are present. The same model of sedimentation, source and reservoir are therefore taken for this basin as for the Campbell Basin. The only difference is that the marine transgression may have occurred much earlier as this rifted basin was open to the primary rift zone which eventually separated New Zealand and Antarctica. Because of the limited thickness of sequence and by comparison with the Great South Basin, any source rock could only just be mature at 3.5 km depth. This, together with its great distance from the South Island, means that it is considered the poorest hydrocarbon prospect of the Campbell Plateau.